JANUARY 2014 • FOODSERVICE EQUIPMENT & SUPPLIES • 83 cutting down on paper for printing, turning down thermostats or reducing water and energy use. "It's easy to say going green costs more money, but do we really know how much more? We don't if we don't re- ally look into it," Christian says. "Before one of my clients became a B Corp, they were doubling up on compostable garbage bags. By simply switching to compost bins, which don't require any bags, we cut down on the need for more of those expensive bags in the frst place. And when the client found ways to reduce the amount of waste it sends to the landfll, the number of trash bags it uses declined, too. "Once you become a B Corp or even head in that direction, you start looking at everything differently," Christian adds. For example, one of his K-12 operator clients found that buy- ing more sustainably produced beef cost 13.8 percent more, but by lowering waste, energy and other operational costs, the client was able to easily offset that extra investment. "Since we stopped individually wrapping meals in plastic wrap and preparing more meals in bulk, this was another area where we balanced out those food costs," he says. The school also reduced the burger portion from 4 ounces to 3.5 ounces with barely a notice or concern. Phase two will focus on cutting more costs through effciencies to increase funds for an on-site garden. Sometimes, though, becoming a B Corp and adopting more green practices is simply a matter of doing the right thing. "I could easily externalize my costs by simply choosing to use Styrofoam and just watching it end up in the landfll without having to pay the extra cost for recyclable materials or composting," Christian says. "By not taking responsibility for my actions, I may see my single bottom line remain high for a while, but over the course of several years as landfll and waste hauling costs go up, then that impacts my bottom line in the long run. Essentially I will already be ahead of the curve when those costs do go up." Ideally, the more companies that jump on the B Corp bandwagon now, the more impact they may collectively have on reducing large-scale costs like waste, energy and water. Certainly, the marketing component is a powerful motivator for making the B Corp switch. "There is such a competitive advantage to being able to prove your green- ness," Christian says. This is especially the case as consumers continue to grow more skeptical amidst growing green- washing — the practice of exaggerating the environmental benefts of a company's products or efforts. Measuring Green In addition to adopting or homing in on more sustainable business practices, regular measuring and analysis of proft margins is an important part of the puzzle. "Becoming a B Corp forces you to measure in places where you haven't measured before," says Christian. 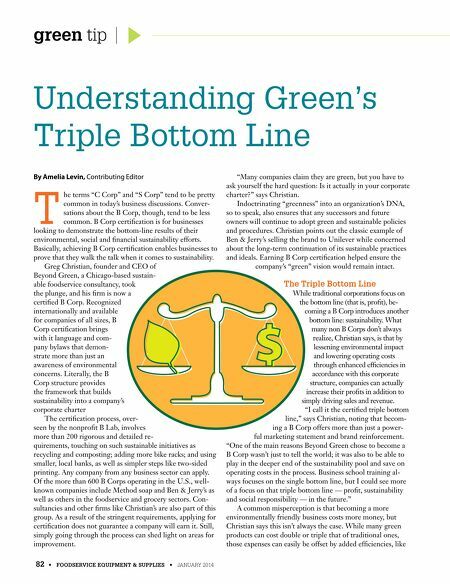 B Corps essentially quantify greenness in clear dollars and cents. For restaurants and other foodservice operations, that might mean something as simple as separating energy meters in the kitchen to track usage or developing an overproduc- tion log to track waste. "By weighing all the garbage at every station we can see where we overproduced and capture that data to make changes," Christian says. "If the operation bought 100 pounds of ground beef but the production says staff tossed 15 pounds of it at the end of the day, that means this foodservice operator can buy and produce less." When production costs are reduced, profts go up. Editing down the menu can also help cut waste and costs. At one school client, Christian cut down the entrée selec- tion from six to just a few, including a vegetarian option. Despite these changes, the operator did not compromise customer satisfaction. "The challenge in the foodservice community is always how do we serve great food sourced and produced sustain- ably, but within a budget?" Christian says. 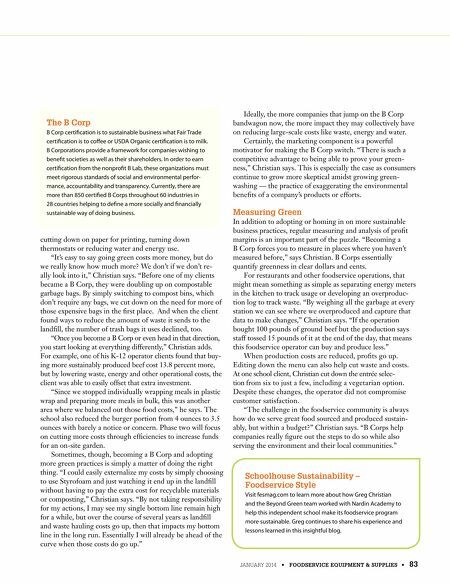 "B Corps help companies really fgure out the steps to do so while also serving the environment and their local communities." The B Corp B Corp certifcation is to sustainable business what Fair Trade certifcation is to cofee or USDA Organic certifcation is to milk. B Corporations provide a framework for companies wishing to beneft societies as well as their shareholders. In order to earn certifcation from the nonproft B Lab, these organizations must meet rigorous standards of social and environmental perfor- mance, accountability and transparency. Currently, there are more than 850 certifed B Corps throughout 60 industries in 28 countries helping to defne a more socially and fnancially sustainable way of doing business. Schoolhouse Sustainability – Foodservice Style Visit fesmag.com to learn more about how Greg Christian and the Beyond Green team worked with Nardin Academy to help this independent school make its foodservice program more sustainable. Greg continues to share his experience and lessons learned in this insightful blog.